Are you looking for St. Patrick Day Crafts to do with your family? You have come to the right place. We love this time of year. Here is our collection of fun things to create together in the kitchen, make together at the table and activities for kids that encourage learning. All of these ideas are St. Patrick’s Day inspired! Kid Color Pages for St. Patrick’s Day – a collection of six color pages for kids which include a leprechaun, a rainbow, a hat, a horseshoe, a pot of gold and a shamrock. Lucky Charms Cupcakes – the best cupcake recipe on the planet partnered with green icing and Lucky Charm cereal! Green Party Punch – easiest punch ever! Shamrock Sun Catchers Craft– a great Spring activity for preschoolers and early learners. 35 St Patrick Day Activities on Pinterest– more fun ideas we found on Pinterest. 10 St Patrick Day Activities for Little Ones– a collection of 10 activities to keep little hands busy. Shamrock Color Sort with Free Printable– a great sorting activity for preschoolers. 12 Crafts for Celebrating Leprechaun Day– super fun ideas. 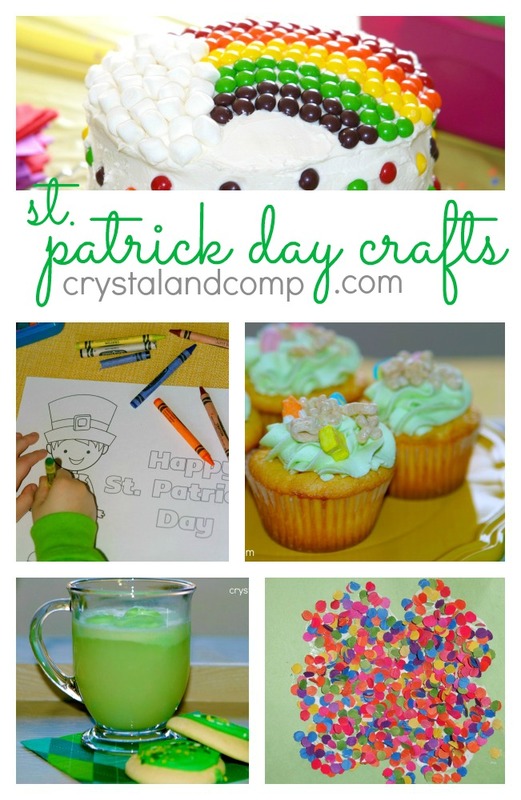 57 St Patrick Day Ideas from Crystal & Co. Readers– all things submitted by my awesome readers! Check back often as new ideas and projects are added!